he grows rare conifers and Japanese maples in Oregon while doing landscape design in Chicago and Boston. If you love Venn diagrams, try this. Draw a circle that contains all wholesale growers. Then draw another circle that contains all retail nursery owners, and another circle that contains all landscape designers. In Oregon it’s rare — but hardly impossible — to find people who do all three. But then, where these three circles overlap, draw another circle containing individuals with a local business presence in three U.S. time zones. And then draw another circle inside all of those, containing people who are 32 or younger. Now we’re talking really rare. Brent Markus — the man inside all of these circles — is a rare individual. Perhaps that’s why his wholesale nursery is called Rare Tree Nursery. But really, it’s the rare plant material he grows: some 700 varieties of dwarf conifers, plus an assortment of Japanese maples. All of these are grown on his 13-acre farm near Silverton, Oregon, plus a recently acquired 80-acre plot in Canby, Oregon. He then sells them to garden centers and specialty nurseries in the Midwest, the East Coast, and increasingly, the West Coast. He also sells them through Conifer Kingdom (his retail location on the Silverton farm), and uses them in his landscaping operation that serves customers in Chicago (where he grew up) and Boston (where he resides). Brent’s interest in rare conifers began in 1994, when he was 12 years old. In 1998, his parents decided to remove the large trees and redesign their backyard. “They hired a traditional landscape architect with a traditionally limited understanding of plant diversity,” Brent said. When that didn’t work out, Brent stepped in. “At the encouragement and expense of my parents, I started a dwarf conifer and Japanese maple collection in their garden,” he said. Before long, while still in high school, he began landscaping for family and friends. At first he sourced his plants from a specialty nursery outside of Chicago. “But I quickly learned the best selection and the best quality came from Oregon,” he said. Initially, he ordered boxes from Stanley and Sons and from Porterhowse Farms. “Two years later, I was receiving partial truckloads,” he said. In 2000, Brent enrolled at Cornell University, the Ivy League school located in upstate New York. He began his studies for a degree in landscape architecture, with a minor in horticulture, and graduated in 2004. “All those years, I continued to design and supply unusual plant material for a Chicago clientele, using Oregon plant material,” Brent said. He earned his master’s degree in horticulture from Cornell University in 2008. With degrees in hand, Brent wanted to keep landscaping. But he decided the best way to source plant material was to grow his own, and the best place was Oregon. “I think people underplay it, but firstly, the climate makes it easier to grow plants here,” he said. “I can grow most woody plant material twice as fast as I could in the Midwest or the East. So, Brent purchased the inventory of Wood’s Creek Horticultural in Salem, Oregon, and used it (along with thousands of other plants he brought in) to set up Rare Tree Nursery. He hired the Wood’s Creek team, led by Richard Haslebacher, to manage his nursery as well. “My landscape design and my wholesale nursery are both rooted in my love for crazy-looking plants,” he said. Brent enjoys showing customers the variety of colors that are available in dwarf conifers. “Many customers have said they’ve never seen more yellow,” he said. Initially, the nursery was a difficult go. It took three years to grow the material up to saleable size. And that’s to say nothing of the bad economy. 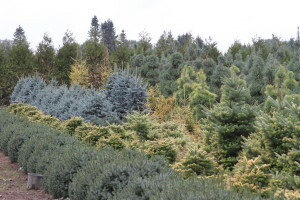 Wholesale sales finally began in 2010, followed by the establishment of the retail Conifer Kingdom in 2012. “I was never interested in going into retail, but with the tremendous varieties and limited quantities we were producing, it was a logical outlet for selling products that had limited availability,” Brent said. All the while, Brent continued landscaping in the Chicago area, and upon moving to the Boston area, he took on clients there, too. 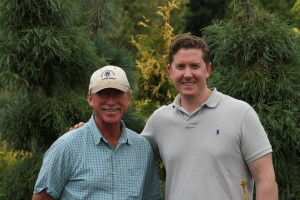 Rare Tree Nursery owner Brent Markus (right) and nursery manager Richard Haslebacher work together to supply customers with quality plants. The operation began with two employees and now has 10–15, depending on the time of year. This past fall, Brent took on an investor and acquired the 80-acre Canby farm, which will allow him to expand growing operations dramatically.